Do you need some easy party finger food recipes? Spicy chicken wings can be perfect for a snack with friends in front of the TV during the Super Bowl or with any other occasion. 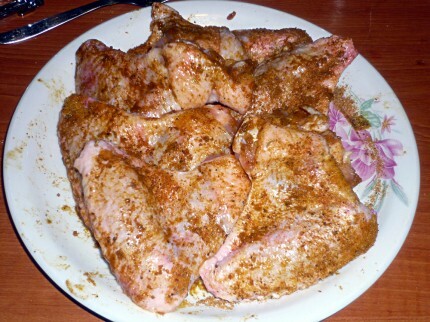 There are several methods of making spicy chicken wings. I’ve chosen to bake them, because it’s not only healthier than deep frying, but also easier: after putting the wings in the oven, all you have to do is wait the required amount of time. Count your guests and buy 3-4 chicken wings for each person. My recipe makes six wings and I ate four of them as soon as I took them out of the oven. 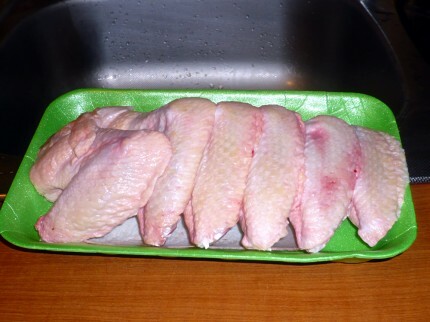 Wash the chicken wings in cold water. Remove any hairs you can see. Hairy chicken wings are not very appealing, so you want to make sure your guests won’t have a surprise. A surefire way to get rid of all hair is to scorch the wings a little bit on the stove top, however you need to have a gas stove for that. My wings were clean, so washing was enough. Prepare a dry rub. I used the rub from this roast chicken recipe, improved with a tablespoon of curry powder and a teaspoon of ground red hot chili flakes. 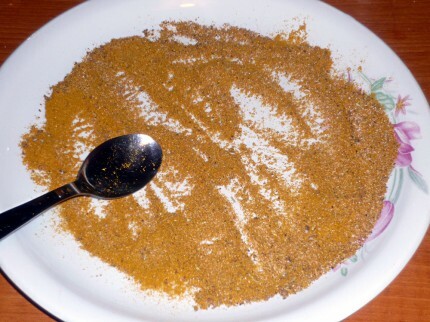 If you start your dry rub from scratch, mix the curry powder and the chili flakes with one teaspoon of salt, half teaspoon ground black pepper and half teaspoon dried rosemary. Spread the rub on a plate. Just start with a small amount and add some when needed. In this way, you can save the rub you won’t use. 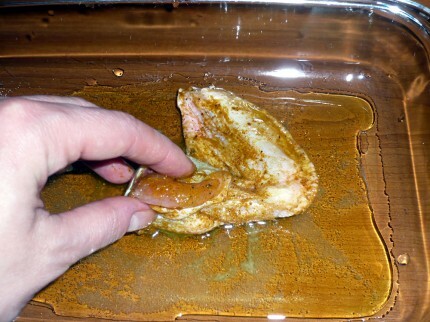 Coat each chicken wing thoroughly. 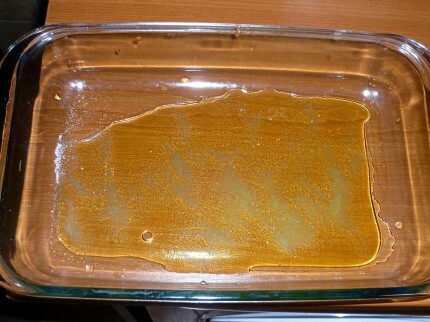 Pour one tablespoon of salt and two tablespoons extra virgin olive oil in a dish. 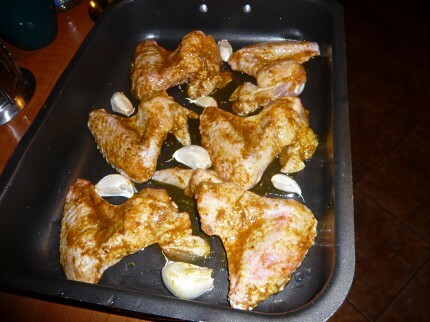 Coat the chicken wings in olive oil and salt. Pre-heat the oven to 400F. 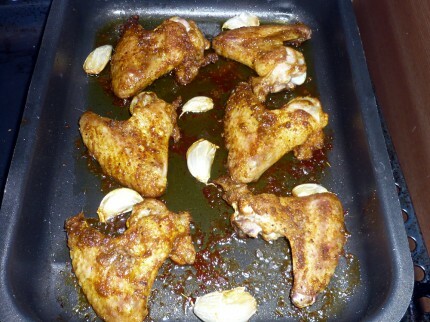 Set the chicken wings on a baking tray, making sure they don’t touch each other. Add 7-8 whole garlic cloves between the wings. Roast garlic is simply delicious and it gives a wonderful flavor to the meat. Roast the chicken wings for about 30 minutes on medium to high heat. 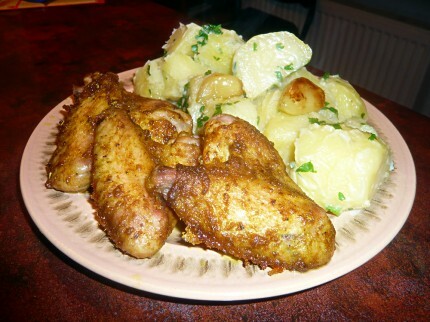 Arrange the chicken wings nicely on a plate (or more, if you made lots of them) and serve them hot. I served mine with a side dish of potatoes with butter and parsley and with rocket salad with grated cheese, olive oil and lemon juice.